slmag.net 51 ECO // 07 Compactable Urban Cycle designed by Victor Aleman with a folding frame and wheels (victoraleman.mx) From Café du Cycliste, the Wolf cycling cap ($35), Lucienne jersey in Night Blue, and Annabelle black and white bib shorts ($262; cafeducycliste.com). e Giant TCR Advanced SL is a special edition race replica bike developed to commemorate Tom Dumoulin's victory at the 2017 Giro D'Italia. 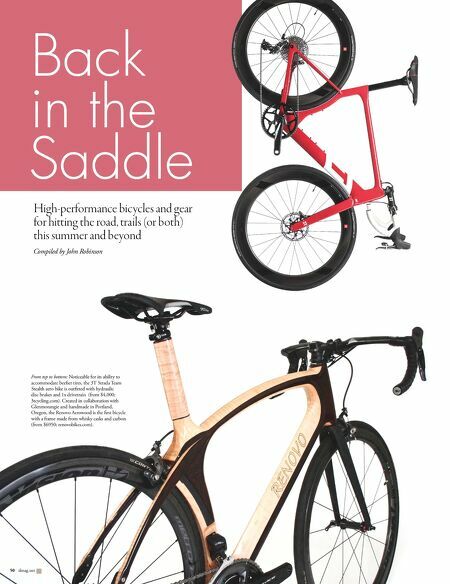 e bike has the lightest frameset ever produced by Giant, as well as the highest stiffness- to-weight ratio of any road bike on the market ($8,500; giant-bicycles.com). e Cannonade Synapse Carbon Disc Dura-Ace is ideal for high mileage days, delivering a smooth ride and good pedal efficiency on a variety of surfaces ($4,999; cannonade.com). BMC's Teammachine has won the Tour de France, the Olympics and World Championships. 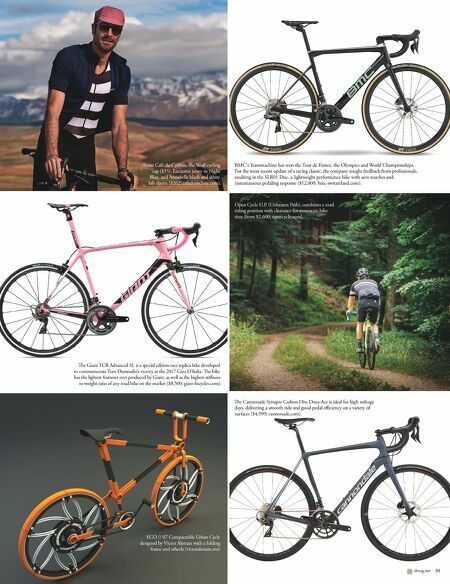 For the most recent update of a racing classic, the company sought feedback from professionals, resulting in the SLR01 Disc, a lightweight performance bike with aero touches and instantaneous pedaling response ($12,000; bmc-switzerland.com). Open Cycle U.P. (Unbeaten Path), combines a road riding position with clearance for mountain bike tires (from $2,600; opencycle.com).